The symptoms of gall bladder disease can be quite distressing, with the most dreaded being gallstone attacks. The gallbladder is an important organ that plays a valuable role in the digestive system. 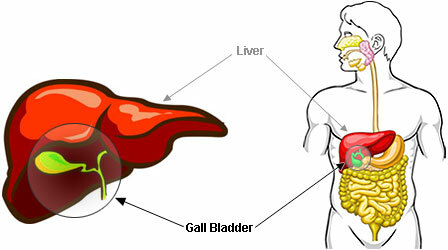 The gallbladder is situated towards the upper right side of the abdomen just beneath the liver. 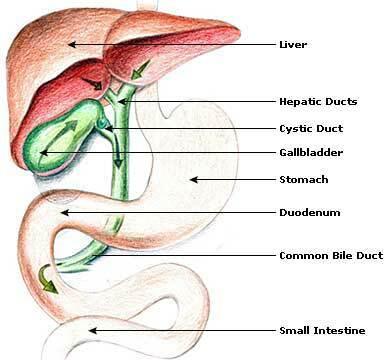 Bile, which is produced by the liver, is essential for digestion, particularly of fats. The gallbladder works as a storage facility for bile and it releases it whenever food is consumed to facilitate digestion. Gallbladder surgery or gallbladder removal is therefore not always the best treatment for gallbladder disease and should only be used as a last resort. In some cases in fact it has been found that gallbladder symptoms persist even after removal of the gallbladder. An appropriate gall bladder diet can often help counter the symptoms and even facilitate healing. The gallbladder is susceptible to some common disorders, the most prevalent being gallstones, cholecystitis, and gallbladder cancer. They are often collectively referred to as gallbladder disease. Natural treatments and self care are an essential aspect of treatment which is why gall bladder home remedies and gall bladder disease diets are so sought after. The main problems which afflict the gallbladder are an inflammatory condition known as cholecystitis and the presence of gallstones in the gall bladder. The latter condition, gallstones in the gallbladder, is called cholelithiasis. The former often leads to the latter. Gallstones are usually caused by disturbances in the composition of the bile. The development of gallstones is the most common problem causing an inflammatory condition referred to as cholecystitis. Digestive problems, like bloating constipation and indigestion, or intolerances to foods like fats are common gall bladder symptoms. The symptoms of gall bladder disease generally include severe abdominal and epigastric pain, and pain radiating and extending towards the back and around the right rib cage. This primary symptom of gallbladder inflammation and pain is often referred to as biliary colic. The symptoms of gall bladder disease are not always obvious however, and many patients may in fact experience no symptoms at all. Stones in the gall bladder symptoms in women can sometimes be mistaken for premenstrual cramps. Gallbladder disease could be a lot more threatening than it appears as in some cases the condition can cause life threatening complications like peritonitis, biliary cirrhosis, cholangitis and pancreatitis. Gall bladder infection symptoms are often similar to the symptoms of gall bladder stones and so it is important to schedule an appointment with your doctor as soon as possible. Gallbladder disease is a rare phenomenon in children, but at the same time it is not something unheard of. Unfortunately the incidence of such conditions has been found to be increasing in recent years and it would be advisable for parents to be watchful for any gallbladder symptoms in children. Gallbladder symptoms during pregnancy like back pain may be confused with other common pregnancy symptoms. Gallbladder symptoms while pregnant will simply add to the discomfort and fatigue that you are already experiencing, which is why it is important to report any symptoms, no matter how normal you may consider them, to your health care provider. Analyze gallbladder symptoms for gallbladder problems. Choose perfect diets for gallbladder problems with diagnosis of gallbladder attack symptoms. Cure Acute cholecystitis with proper treatment of gallstones in gallbladder. If there is any suspicion of gallbladder disease it would be wise to seek a thorough medical diagnosis. This would mean that you need to provide your health care provider with a thorough medical history and information on any symptoms of gall bladder problems that are present. There will also be a need for a physical examination and some tenderness may be observed in the upper right abdomen. Diagnostic tests also help make an accurate diagnosis and would be particularly handy when the symptoms of gall bladder disease are not so evident. Imaging tests like ultrasound scans can help identify and locate the presence of gallstones, while a hepatobiliary scan, which is a nuclear scan, can help identify any gallbladder obstruction or the presence of cholecystitis. CT scans or MRI scans of the abdomen could also help in the detection of gallbladder cancer, or also to rule out any such suspicion. The main diseased gallbladder symptom is acute or intermittent pain in the abdomen. Indigestion, gas, a feeling of fullness after meals, constipation, and nausea are the other usual symptoms. Other gall bladder symptoms include intolerance to fats, dizziness, jaundice, anaemia, acne, and other lesions. The main cause of gall-bladder disorders is overnutrition resulting from excessive intake of refined carbohydrates, especially sugar. Overnutrition also leads to increased cholesterol secretion. Meals rich in fats may cause an attack of gall-bladder pain or gallstone colic. Other causes are chronic constipation, poor health, hereditary factors, and stress. The Chinese relate gall-bladder disorders with the emotion of anger. Although the causes of the symptoms of gall bladder disease or gallbladder attacks may be easy to identify, the actual causes for gallbladder disease and the conditions that increase the risk of developing gallbladder disease are a lot more varied and at times vague. Women who have had multiple pregnancies and consequentially high levels of estrogen have been found to be a lot more susceptible to gallbladder disease as are women on birth control pills. As pointed out, one of the most common risk factors would be obesity or being overweight. Your diet is one of the biggest influencing factors in terms of the risk of gallbladder disease as a high fat diet that is low in fiber is found to increase the risk of gallstones and other diseases. The influence of heredity off course cannot be ruled out, but this is a risk factor that cannot be eliminated, but it can be guarded against. Studies conducted have also revealed that there is a higher risk of gallbladder disease developing among Native American or Hispanic populations. Patients with sickle cell anemia are also at a risk of developing gallbladder disease. While obesity is dangerous and poses many health risks, crash dieting and rapid weight loss are just as dangerous and increase susceptibility to gallbladder disease. Post gall bladder syndrome is also referred to as ghost gallbladder pains and occurs after the removal of the gall bladder. In such a case, the patient may experience symptoms that are similar to gallbladder stones even after the gallbladder has been removed. In some cases, the pain may be have a psychological origin while in others it may be due to pancreatic problems. Keep in mind that in any condition of the gall bladder, cholesterol is a major culprit and cholesterol rich foods feature prominently on any list of gall bladder foods to avoid. Fresh juice of beets, and the juices of carrot and cucumber in quantities of 100 ml each, are one of the finest cleansers of the gall-bladder. This combined juice has proved beneficial in the treatment of all disorders related to this organ, and should be taken twice daily. The pear is another excellent remedy for gall-bladder disorders. The fruit or its juice should he taken liberally by the patient with beneficial results. It exercises a special healing effect on all gall-bladder disorders, including gallstones. The flowers, seeds, and roots of chicory or the endive plant are considered valuable in gall-bladder disorders. A decoction of about 30-60 ml of the flowers, seeds, or roots can be used three times daily with beneficial results in the treatment of these disorders. Endive or chicory juice in almost any combination promotes the secretion of bile and is, therefore, very good for both liver and gall-bladder dysfunctions. Chicory can be included for use as a tea or even consumed as a juice. Chicory powder can also be used to a great advantage in the treatment of gall bladder disease. Add around 30 mg of the powder to a glass or 100 ml of water and set it to boil. Strain the solution and drink it twice a day. Keep this up for a month and you should find some gall bladder pain relief. Dandelion has a beneficial effect on the gall bladder. About 125 ml each of the juices of dandelion and watercress should be taken twice daily. Combined with a vegetarian diet, without much sugar and starch, these juices help to make the gall¬bladder normal. Dandelion tea is in fact quite popular as an herbal remedy for a diseased gall bladder. You may also prepare an herbal concoction with a mixture of dandelion and milk thistle. Dandelion is believed to help stimulate and encourage bile production, which can be helpful for gallstones as it cause a contraction of the gall bladder causing any stones to be expelled. It also causes an increase in cheneoxycholic acid, which can be highly beneficial because of its effect of dissolving gall stones. An oil cure has been advocated by some nature cure practitioners for the removal of gallstones. Raw, natural, unrefined vegetable oils of olive or sunflower are used. The procedure is to take 30 ml of vegetable oil, preferably olive oil, first thing in the morning and follow it immediately with 120 ml of grapefruit juice or lemon juice. This treatment should be taken every morning for several days, even weeks, if necessary. Olive oil has been highly regarded for its health benefits since ancient times, particularly in the Mediterranean area where it has traditionally grown. Olive oil can be included in a variety of recipes and is a great substitute for other unhealthy oils. You could use it as a salad dressing or in cooking. Another one of the popular gall bladder home remedies with olive oil includes a mixture of the oil with honey and lemon juice. Have a spoonful or two of this mixture around twenty minutes or so before your meals. You can also use castor oil soaked in a soft cloth and place it against the abdomen as a compress, preferably with a heating pad or hot water bottle. This should help to reduce the swelling associated with a diseased gall bladder. The gallbladder and spleen are connected and so gallstones can place a strain on the spleen. It is therefore important to avoid foods like chocolate, caffeinated beverages, processed flour, and white sugar as these foods are no easy to digest. Smaller gallstones can usually be cleared through dietetic cure. In cases of acute gall-bladder inflammation, the patient should fast for two or three days until the acute condition is cleared. Nothing but water should be taken during this period. After the fast, the patient should take fruit and vegetable juices for a few days. Carrots, beets, grapefruit, pears, lemons or grapes may be taken in the form of juice. Thereafter, the patient should adopt a well balanced diet, with emphasis on raw and cooked vegetables, fruit and vegetable juices, and a moderate amount of fruits and seeds. Yoghurt, cottage cheese, and a tablespoon of olive oil twice a day should also be included in the diet. The patient should avoid meat, eggs, animal fats, processed and denatured foods, fried and greasy foods, refined carbohydrates, alcohol, products made With sugar and coffee, as well as spices, condiments, and pickles. The patient should eat frequent small meals rather than three large meals. The effects of gall bladder removal can be quite severe, with the symptoms associated with gallbladder disease simply being prolonged, and some may become more pronounced. Gallbladder surgery is therefore a treatment option that one should be dissuaded from, unless absolutely necessary. Diet care and restrictions may need to be quite severe too after gallbladder surgery. Removing the gall bladder may only be necessary in irreversible circumstances such as gall bladder cancer or a severely infected gall bladder. In the case of any gall bladder problems, diet being the most important part of natural treatment and self care, it is only natural that beet and other fruits and veggies should feature prominently in a variety of gall bladder home remedies. Although your intake of fats needs to be limited a complete avoidance of fats could aggravate the symptoms of gall bladder disease accentuating the pain and frequency of attacks, so it would be wise to include some healthy fats in moderation in your diet. You can prepare a beet soup with some green vegetables added in and a small amount of flax seed oil. Try and include a lot of pear juice in your daily diet particularly when you begin your treatment and if you start with a fruit diet. You may later switch to having a glass or two of this refreshing juice on a daily basis. The pain of gallstone colic can be relieved by the application of hot packs or fomentation to the upper abdominal area. A warm-water enema at body temperature will help eliminate faecal acculumations if the patient is constipated. Physical exercise is also essential. Surgery becomes necessary if the gallstones are very large or in cases where they have been present for long. Gall Bladder Removal, also known as Cholecystectomy, is a procedure performed under general anesthesia. The surgeon makes an incision in your stomach and lifts the gallbladder through the incision. The gall bladder removal surgery may take about an hour or or more. The most common gall bladder pain is Biliary Gallbladder Pain or Colic. The symptoms include acute pain in the upper or upper-right abdomen, accompanied by nausea and vomiting. Gall Bladder diet includes more fruits and vegetables such as Cucumbers, Beet, Tomatoes, Shallots, Grapes, Apple, Pears. Striclty avoid egges, pork, chicken, fried foods and trans fat oils when you are on a gallbladder diet. Does gall bladder disorder affect the pancreas, liver or spleen in any way? Do Kidney stones have any negative effects on the gall bladder?